Lattices, Universal Algebra and Categories. Topological Dualities in Lattice Theory. Elementary Properties of Lukasiewicz-Moisil Algebras. Connections with Other Classes of Lattices. Filters, Ideals and &ngr;-Congruences. Representation Theorems and Duality for Lukasiewicz-Moisil Algebras. Categorical Properties of Lukasiewicz-Moisil Algebras. Monadic and Polyadic Lukasiewicz-Moisil Algebras. Lukasiewicz Logics. Appendix: Applications to Switching Theory. References. Author Index. Subject Index. 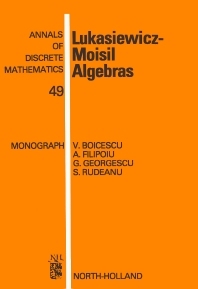 The Lukasiewicz-Moisil algebras were created by Moisil as an algebraic counterpart for the many-valued logics of Lukasiewicz. The theory of LM-algebras has developed to a considerable extent both as an algebraic theory of intrinsic interest and in view of its applications to logic and switching theory. This book gives an overview of the theory, comprising both classical results and recent contributions, including those of the authors. N-valued and &THgr;-valued algebras are presented, as well as &THgr;-algebras with negation. Mathematicians interested in lattice theory or symbolic logic, and computer scientists, will find in this monograph stimulating material for further research.